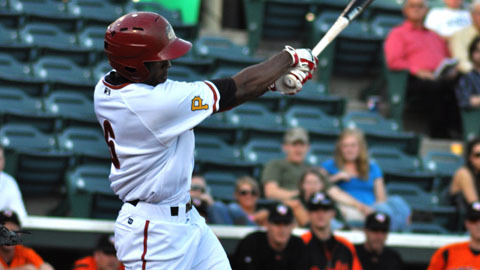 Portland, ME - The Eastern League of Professional Baseball is pleased to announce that Altoona Curve outfielder Starling Marte has been selected as the 2011 Eastern League Rookie of the Year. Marte is making his Double-A debut with Altoona this season after hitting .315 (70-for-222) with 16 doubles, five triples, 41 runs scored, 33 RBI and 22 stolen bases in 60 games in an injury shortened campaign with the Bradenton Marauders of the Class-A Florida State last season. The 22-year old is batting .335 (177-for-528) with 38 doubles, eight triples, 12 home runs, 90 runs scored, 50 RBI, 24 stolen bases, a .372 on-base percentage and a .506 slugging percentage in 127 games for the Curve this season. Marte, who is a native of Santo Domingo, Dominican Republic, currently leads the league in hits (177) and batting average (.334). He is also ranked among the leaders in doubles (38-tied 1st), runs scored (90-2nd), total bases (267-2nd), extra-base hits (58-3rd), triples (8-tied 4th), OPS (.878-5th), slugging percentage (.506-6th), steals (24-tied 9th) and on-base percentage (.372-10th). Starling's 177 hits this season not only leads the league but is also a new Altoona Curve single-season franchise record. With his performance this season it is not surprising the 6'1", 170 lb. slugger has won numerous awards and accolades, including taking home the Eastern League Player of the Week award for the period of August 8th-14th, being selected for the World Team for the 2011 Futures Game in Arizona, representing the Western Division at the 2011 Northeast Delta Dental Eastern League All-Star Game in Manchester, New Hampshire and being chosen as an outfielder on the recently announced 2011 Eastern League Season Ending All-Star Team. Starling, who entered the 2011 season rated by Baseball America as the fourth best prospect in the Pirates organization, was signed by the Pittsburg Pirates as a non-drafted free agent on January 4, 2007. New Hampshire catcher Travis d'Arnaud finished second in the voting for the Eastern League Rookie of the Year Award and Harrisburg first baseman Tyler Moore ranked third in voting for the award, which was voted on by Eastern League managers, sportswriters, radio and television broadcast personnel and other members of the media.